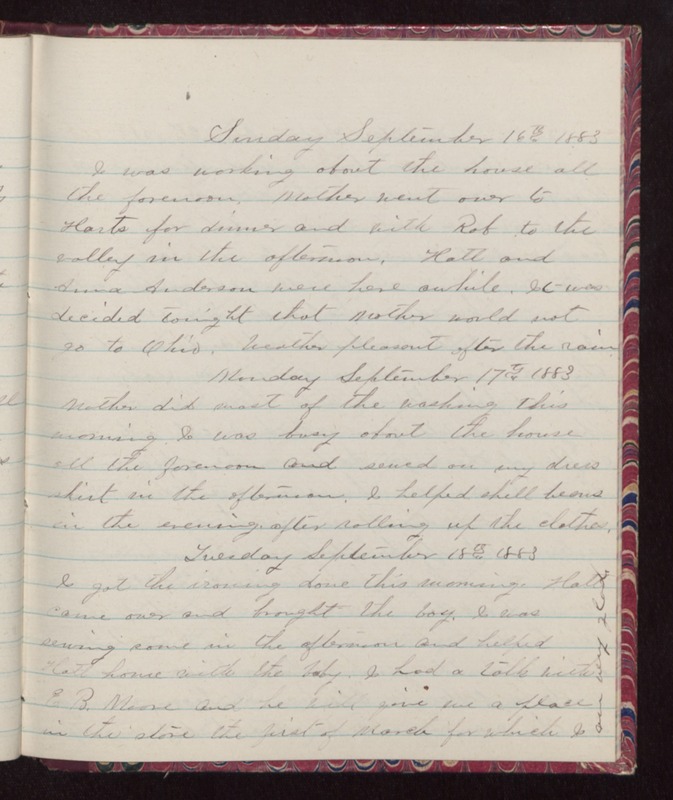 Sunday September 16th 1883 I was working about the house all the forenoon. Mother went over to Harts for dinner and with Rob to the valley in the afternoon. Hatt and Anna Anderson were here awhile. It was decided tonight that Mother would not go to Ohio. Weather pleasant after the rain. Monday September 17th 1883 Mother did most of the washing this morning. I was busy about the house all the forenoon and sewed on my dress skirt in the afternoon. I helped shell beans in the evening, after rolling up the clothes. Tuesday September 18th 1883 I got the ironing done this morning. Hatt came over and brought the boy. I was sewing some in the afternoon and helped Hatt home with the baby. I had a talk with E.B. Moore and he will give me a place in the store the first of March for which I am very glad.